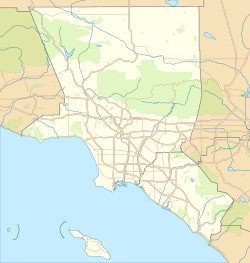 Castaic, California (also spelled Castec, or Kashtiq; pronunciation is a source of contention between older and newer residents, see below) is an unincorporated community located in the northern part of Los Angeles County, California. Many thousands of motorists pass through Castaic daily as they drive to or from Los Angeles on Interstate 5. Castaic Lake is part of the California Water Project and is the site of a hydro-electric power plant. Castaic is 41.7 miles (67.1 km) northwest of Los Angeles Union Station and due north of the city of Santa Clarita, California. Location of Castaic in Los Angeles County, California. Castaic is well known for its decades-long range war in the late 19th and early 20th centuries that resulted in dozens of deaths before hostilities ceased in 1916. On Spanish documents, the original spelling was Castec, which represented the Chumash Native American word Kashtiq, meaning "eyes" or "wet spot." Castec is first mentioned on old boundary maps of Rancho San Francisco, as a canyon at the trailhead leading to the old Chumash camp at Castac Lake (Tejon Ranch), which is intermittently wet and briny. Modern Castaic began in 1887 when Southern Pacific set up a railroad siding on the line between Piru and Saugus Station, naming it "Castaic Junction". Between January and April 1890, the Castec School District adopted the new spelling, Castaic. Between 1890 and 1916, the Castaic Range War was fought in Castaic country over ranch boundaries and grazing rights. It was the biggest range war in U.S. history. A feud started over Section 23, where the Stonebridge subdivision is now. William Chormicle had legally bought the property, but William "Wirt" Jenkins was already storing grain on it and said he had filed for ownership. During a heated dispute, Chormicle and a friend shot and killed two of Jenkins's cowhands. They were acquitted in court. Jenkins, however, was the local Justice of the Peace with friends of his own, and the feud quickly grew into war. Former Los Angeles Rangers (among whom Jenkins had fought) and other notables were drawn in. The war claimed dozens of lives and foiled a negotiator, a forest ranger whom President Theodore Roosevelt had sent in to quell it. The hamlet of Castaic began in 1915 with the opening of the original Ridge Route, which brought travelers looking for gasoline, water, food, and lodging to the community. Some of the earliest businesses started in Castaic are Castaic Brick (founded 1927) and George Dunn's Wayside Dairy (founded 1929). Sam's Place (Sam Parson, proprietor) on the Ridge Route has long since gone and is now a memory. Castaic is a major truck stop along the Interstate 5 freeway. Castaic has the last traditional cattle roundup—with horses, lariats, and branding irons—in Los Angeles County. It has been held by the Cordova family since 1834, when the family first settled here. Members of the Cordova family were scouts for the U.S. Army during the Mexican War in 1846 and helped identify bodies during the St. Francis Dam disaster in San Francisquito Canyon in 1928. Operations scaled back in 1967 when the government seized around 1,000 acres (400 ha), including the ancestral ranch-house, for the planned Castaic Lake and dam. Castaic covers 7.3 square miles (19 km2) of area and includes the Val Verde and Chiquito Canyon areas. Castaic Lake is the southern terminus of the west branch of the California Water Project. A 1,175-megawatt pumped-storage hydroelectric plant at the north end of Castaic Lake captures the energy from the falling water descending toward the Los Angeles area. The area is seismically active. On January 3, 2015, a pair of earthquakes of magnitude 3.1 (location: 34°36′36″N 118°38′06″W﻿ / ﻿34.610°N 118.635°W﻿ / 34.610; -118.635, depth=9.0 km (5.6 mi)) and 4.2 (location: 34°37′12″N 118°37′48″W﻿ / ﻿34.620°N 118.630°W﻿ / 34.620; -118.630, depth=8.9 km (5.5 mi)), respectively, were reported about 14 kilometres (8.7 mi) north of Castaic. The epicenter was 16 miles (26 km) from Santa Clarita, California. This region experiences warm and dry summers, with no average monthly temperatures above 71.6 °F (22.0 °C). During the months of June though September, however, the average high temperature ranges from the 90s F (30s C) to above 100 °F (38 °C). According to the Köppen Climate Classification system, Castaic has a warm-summer Mediterranean climate, abbreviated "Csb" on climate maps. The 2010 United States Census reported that Castaic had a population of 19,015. The population density was 2,612.5 people per square mile (1,008.7/km²). The racial makeup of Castaic was 13,607 (71.6%) White (57.1% Non-Hispanic White), 630 (3.3%) African American, 119 (0.6%) Native American, 2,162 (11.4%) Asian, 26 (0.1%) Pacific Islander, 1,466 (7.7%) from other races, and 1,005 (5.3%) from two or more races. Hispanic or Latino of any race were 4,716 persons (24.8%). The Census reported that 18,946 people (99.6% of the population) lived in households, 69 (0.4%) lived in non-institutionalized group quarters, and 0 (0%) were institutionalized. This statistic, however, does not include the population of the North County Correctional Facility, a Los Angeles County Jail with a population of 3,800 fully institutionalized inmates. According to the 2010 United States Census, Castaic had a median household income of $106,538, with 7.0% of the population living below the federal poverty line. The population was spread out with 5,761 people (30.3%) under the age of 18, 1,717 people (9.0%) aged 18 to 24, 5,144 people (27.1%) aged 25 to 44, 5,302 people (27.9%) aged 45 to 64, and 1,091 people (5.7%) who were 65 years of age or older. The median age was 35.6 years. For every 100 females, there were 101.2 males. For every 100 females age 18 and over, there were 99.8 males. There were 5,932 housing units at an average density of 815.0 per square mile (314.7/km²), of which 4,843 (84.2%) were owner-occupied, and 908 (15.8%) were occupied by renters. The homeowner vacancy rate was 1.2%; the rental vacancy rate was 6.7%. 16,231 people (85.4% of the population) lived in owner-occupied housing units and 2,715 people (14.3%) lived in rental housing units. The Los Angeles County Sheriff's Department (LASD) operates the Santa Clarita Valley Station in Santa Clarita, serving Castaic. Station 149 of the Los Angeles County Fire Department serves the community. The Castaic Town Council meets monthly. The Castaic Union School District consists of four schools: three elementary schools and one middle school. Live Oak Elementary School, Castaic Elementary School and Northlake Hills Elementary School serve students in kindergarten through sixth grade. Castaic Middle School serves grades seven through eight. The school district does not yet have a high school. Currently, Castaic high school students attend either Valencia High School or West Ranch High School in the William S. Hart Union High School District. The Hart District offices are located 13 miles (21 km) southeast of Castaic. The community has a ZIP Code of 91384 and area code of 661. The historical spellings of Castaic (Kashtiq, Castec, and Castac) all are written as having two syllables. Long-time residents have generally held that Castaic is therefore pronounced to rhyme with "beef steak" (i.e., "kasteak"). More recently, many have taken to an alternate pronunciation, based on the current spelling, with three syllables, to rhyme with "prosaic" (i.e., "kastayik"). In 2013, at a meeting over the planned Castaic High School, people in attendance argued over which pronunciation was right. 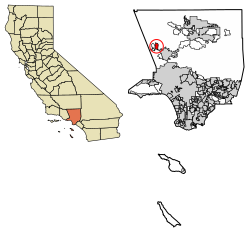 ^ "Castec" is written on diseños (boundary maps) of Rancho San Francisco in the 19th century; it is the Chumash name in Spanish, since Spanish has no 'sh'. ^ Johnson, John R. (1978). "The Trail to Kashtiq". The Journal of California Anthropology, SCVHistory.com, Winter 1978, vol 5, no 2, pp 188–198. Retrieved from http://www.scvhistory.com/scvhistory/johnson-kashtiq.htm. ^ "SCVHistory.com, Excerpts from court transcript". Archived from the original on 2015-12-08. Retrieved 2015-12-06. ^ Westsidereader.com "America's Forgotten and Deadliest Range War"
^ Los Angeles Times, "Castaic's Great Range War." ^ SCV History, "The Great Range War"
^ LA Times, "Last Roundup." ^ The Signal, "When everybody was a cowboy." ^ Hamilton, Matt (January 3, 2015). "Earthquake: 4.2 and 3.0 temblors recorded near Castaic". Los Angeles Times. Retrieved 2015-01-04. ^ "M3.1 - 13km N of Castaic, California 2014-12-31 06:27:41 UTC". United States Geological Survey. Retrieved 2015-01-04. ^ "M4.2 - 14km N of Castaic, California 2015-01-04 03:18:09 UTC". United States Geological Survey. Retrieved 2015-01-04. ^ "American FactFinder". United States Census Bureau. Retrieved 2013-12-11. ^ "2010 Census Interactive Population Search: CA – Castaic CDP". U.S. Census Bureau. Retrieved 2014-07-12. ^ "Santa Clarita Valley Station". Los Angeles County Sheriff's Department. Retrieved on 2010-01-21 from "Archived copy". Archived from the original on 2010-01-23. Retrieved 2010-01-22. CS1 maint: Archived copy as title (link). ^ Castaic Town Council. Retrieved from http://www.castaicareatowncouncil.org. ^ SCV History, "Street Knowledge." ^ The Signal, "District decides on ‘Castaic High School’ name." Wikivoyage has a travel guide for Castaic.